But some plants don’t. In fact, they stop setting seeds. “While higher carbon dioxide levels may encourage some plants to grow larger and increase crop yields, elevated temperatures could leave seed crops sterile,” says L. Hartwell Allen, Jr., a soil scientist in ARS’s Chemistry Research Unit in Gainesville, Florida. Allen and ARS plant physiologist Joseph C. Vu have carried out temperature-elevation studies with colleagues associated with the University of Florida-Gainesville and the International Rice Research Institute. They used growth chambers under natural sunlight and greenhouses set for gradient temperatures to evaluate heat tolerance of various cultivars. They measured heat’s effect on yields of rice, grain sorghum, kidney beans, soybeans, and peanuts grown at two levels of carbon dioxide—near ambient (350 parts per million, or ppm) and double ambient (700 ppm)—and at four maximum/minimum daily temperature cycles. Each crop was found to have its own optimal mean daily temperature (OMDT) for seed yield. As temperatures rose, yields decreased, dropping to zero at about 18˚F above each crop’s specific OMDT. Allen says seed productivity generally decreased by about 6 percent for every 1˚F above a given plant’s OMDT. Current summer temperatures in the southern United States are 2˚F-4˚F higher than optimum for most grain crops. Compared to rice and grain sorghum, which yield best at an OMDT of 77˚F, kidney beans were more sensitive to heat, while soybeans and peanuts were less so. Pollination failure was the chief cause of yield declines at higher temperatures. The number of pollen grains per flower and the percent of viable pollen declined as temperature increased, as did the number and size of seeds per pod. Allen found that fewer soybeans were produced at above-optimal temperatures, and individual beans grew less. Peanut yields fell because the number of viable pollen spores and percentage of flowers setting seeds declined, eventually reaching zero. For all the crops studied, even when pollination was successful, shortened seed-filling time and higher respiration rates at moderate temperature increases also contributed to yield declines. Allen says that using traditional breeding to develop crops with built-in heat tolerance may offer the best hope for helping plants—and growers—cope with rising temperatures. “We’re trying to identify cultivars that yield well in very hot environments,” he says. “If heat tolerance could be incorporated into all productive crop varieties, it would lessen the agricultural impact of climate change. “Also, adjusting the time of day when pollen is shed by a plant could improve its viability. Varieties that shed pollen earlier in the day, when temperatures are cooler, would be more likely to flourish.”—By Jim Core, formerly with ARS. L. Hartwell Allen, Jr., is in the Chemistry Research Unit, USDA-ARS Center for Medical, Agricultural, and Veterinary Entomology, 1700 S.W. 23rd Dr., Gainesville, FL 32608; phone (352) 392-8194, fax (352) 392-6139. 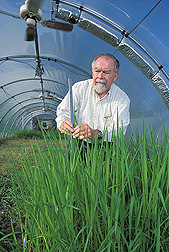 "Rising Temperatures and Plant Productivity" was published in the August 2006 issue of Agricultural Research magazine.